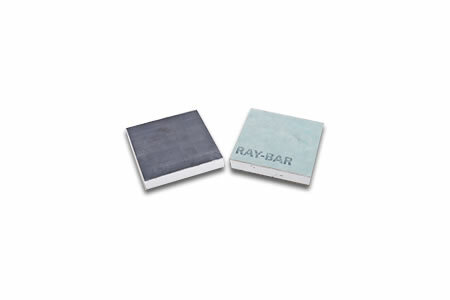 Ray-Bar’s lead backed drywall, also known as lead lined sheetrock or lead lined gypsum wall board, is furnished as 1/2" and 5/8" fire code gypsum board meeting Classification ASTM C 1396, with pure lead sheet meeting Federal Specification QQ-L-201 F, Grade C and ASTM B749-85, Type L51121 factory laminated under pressure to the back side of the gypsum panel. It is custom manufactured to customer specifications and is typically available in one day. Shielding accessories for lead backed drywall installation include a 2" wide lead batten strip for vertical joints and corners and lead discs for screw penetrations. Sheet lead backing must be equal or greater value as the lead in the wall partition where penetration occurs. "The term "qualified expert" used in this report is defined as a medical physicist or medical health physicist who is competent to design radiation shielding for medical x-ray imaging facilities. The qualified expert is a person who is certified by the American Board of Radiology, American Board of Health Physics, or the Canadian College of Physicists in Medicine". *Please Note the above uses of the word "shall" is a requirement, and use of the word "should" is a recommendation. *NCRP is the "National Council of Radiation Protection". *NCRP report #147 supersedes the previous NCRP report #49. X-Ray Lead Glass from Ray-Bar Engineering Corp.